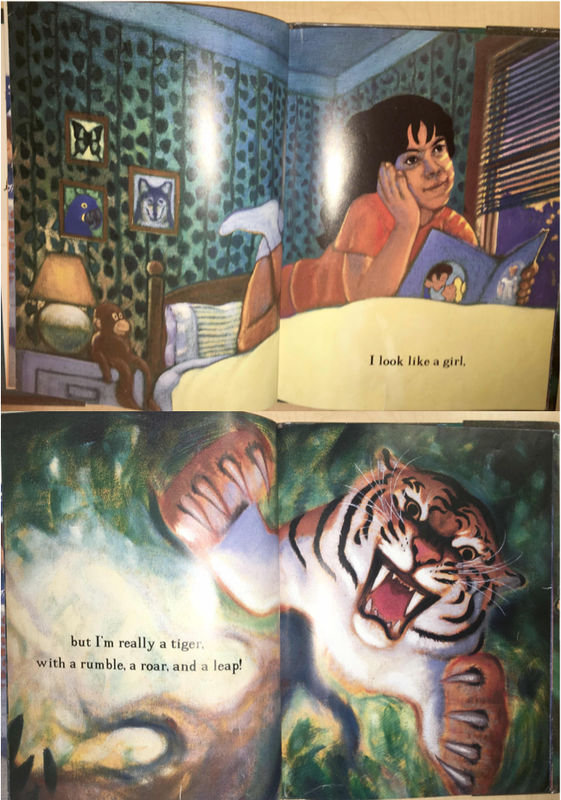 “I look like a girl, // but I’m really a tiger, / with a rumble, a roar, and a leap! // I look like a girl, / but I’m really a dolphin, / with a / spin and a splash / in the sea.” So begins Sheila Hamanaka’s poetic, mesmerizing, and sadly, out-of-print I Look Like a Girl. Four children, whose skin and hair range from light to dark, reveal that appearances can deceive; someone who looks like a girl may actually be a condor, mustang, wolf, or jaguar. While it makes no explicit references to trans or nonbinary children, the underlying messages may resonate with some. Appearances mean nothing; labels are faulty; what’s important is in a child’s heart. Once, after I read this aloud to 3rd graders, a child said: “Wait, I’m confused. Is that kid a girl?” Another child immediately responded, “The point is it doesn’t matter, just BE WHO YOU ARE.” (To read more about how I use this book with kids, click here). 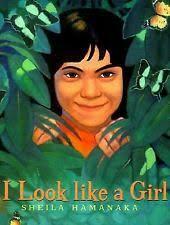 During the past few months of #MeToo, particularly the moments in which the world of children’s literature has grappled with sexual harassment and abuse in our ranks, I’ve often thought of I Look Like a Girl. I’ve seen kids respond to it with everything from fist pumps and “YES”es to soft sighs of relief that someone gets it, a reaction I share. As stories of sexist mistreatment, manipulation, and worse arise, we need to balance them with stories that affirm, empower, and provide safe haven. At its simplest, I Look Like a Girl is an exquisitely written, dynamically illustrated poem. At its most powerful, it reaches across time and space to let children know that they are unique but not alone. William Morrow, the book’s original publisher, is now an imprint of HarperCollins. I’d so love to see a reprint--and the time is now. The ideas communicated in each post belong to that individual author, and they do not represent the views of the entire Reading While White team.